I'm having a quick cup of coffee before I start getting ready for my day at the bookstore. I should probably eat something too. Have you ever been so lazy that you don't even want to pour a bowl of cereal? That's where I'm at right now. 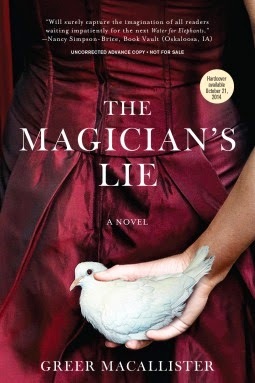 I'm not sure what I'll be reading next, but The Magician's Lie by Greer Macallister is wooing me with it's pretty cover and comparisons to The Night Circus. You'll all be thrilled to know that I'm still watching Star Trek: The Next Generation. I'm in the middle of the last season. I'm trying to stretch it out now because I don't want the great rewatching to be over. I succumbed to peer/internet pressure and listened to the first season of Serial. It was compelling, interesting, and addictive. The in-depth reporting is journalism of the best kind. Listening to the podcast reminded me that I love stories, in all forms. That's what it's all about isn't it? Whether it's a book, podcast, movie, television show...we all love a good story. That's true of almost every single human being. The holiday baking is underway! Yesterday I made peanut butter bonbons and cutout cookies. Both recipes come from my grandmother and have been made for every Christmas since the beginning of time. Well, since the beginning of my grandmother's time at least. There are more things to bake and I'll have to sneak in a cookie/brownie/bar session whenever I have a free moment in the next few days. Enjoy the holidays, folks. Have a peaceful, sane, and safe season. Enjoy the time with your loved ones, gratefully reminisce about those that aren't able to be with you this time, and try to slow down for a day or two. Have a glass of wine, or four. Have a cookie, or five. Rise above the actions of family members that drive you up a wall and sincerely appreciate those family members that make you feel adored. You're so right, it's all about the stories, in whatever form. I have Serial on my list of podcasts to try. The holiday baking sounds lovely! Telling and listening to stories is the way we relate to and function in the world :D Isn't that just great?? Hooray for stories! I haven't eaten cereal in years. We have bacon and eggs...well, at least, eggs, most breakfasts. This morning it was potato chips, though, and leftover pecan apple crisp as the wife went right to sleep after a long night at work (and that was okay too). I think I'll be having a few glasses of rum here...maybe even with some egg nog, who knows? :) May you and your family, Jennifer, have a lovely holiday, and especially your husband, who I'm sure is glad to have the time off. Rum sounds darn good to me! Thanks so much, Bryan. The same to you and yours! I've heard of Serial but haven't given it a try. Maybe I should. :-) I remember watching Star Trek: The Next Generation while growing up. It was one of my dad's favorite shows. I hope you have a good day at the bookstore. You should definitely give Serial a try! Might have to give Serial a try. Sounds interesting. I don't usually do breakfast unless I go out to eat. I settle for orange,pineapple juice most mornings. Serial is really interesting. Fascinating really! I don't know why but pineapple juice sounds so good right now, lol. Yum. Wow! I am coveting the goodies in those pictures. My husband and I watched Star Trek: The Next Generation years ago, and we thoroughly enjoyed it. Now you have me intrigued by Serial. Thanks :D Do you bake much? I think I'm going to have to rewatch the series every couple of years. It's good for my soul! Ooh, I'm so glad you enjoyed Serial! I don't know what to do with myself now that it's over. I like what you said about loving stories in every form. I've recently realized that's why I liked history class in high school... because history is just stories. I listened to all of the episodes in a very binge-like fashion. Next season I'll probably listen week to week. History IS just stories, great point! No wonder I love it so much. Huh. North of Boston has been on my TBR list for so long...maybe one day I'll get to it! Maybe your review will spur me on! I am terrible about eating breakfast. I don't know that it's a lazy thing necessarily but, when you need to get breakfast for two littles and get one off to the bus, sometimes a cup of coffee is all that happens! I will have to see what you think of The Magician's Lie. I keep seeing it, but I just haven't been convinced yet. A Merry Christmas to you, Jen, and the whole family! Oh yes, I remember those days! You wonder if you'll ever eat another hot meal again, lol. I'm 70 pages in right now and I can't decide quite yet either. I'll keep you posted! Thanks so much, Lindsey. Same to you and yours! I quite liked the Magician's Lie and would recommend it! It is well worth its pretty color! It seems like the UPS man stops at my house a couple of times a day lately. (Is that possible?) it's lovely, in any case, since he almost always drops off books.